Going the Rounds at Stinsford with the Thomas Hardy Society is an experience not to be missed, a chance to follow in the footsteps of the old Mellstock Band as described by Thomas Hardy in Under the Greenwood Tree. Next in December 2013. 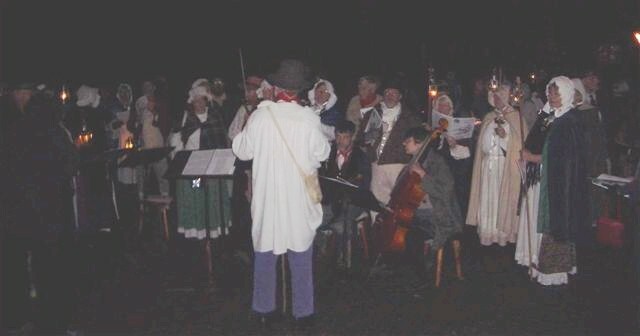 A Village Wedding of about 1820 This light hearted re-creation starts with a parade to the service, which is followed by dancing, singing and games such as "jumping in sacks" and "jingles", in which you are all invited to join. One highlight is the tug of war. Games are especially fun for families with children. This programme is very flexible, lasting from about two to four hours depending on your requirements. We have presented this at English Heritage sites, and as part of village fetes. Wassail is a traditional winter toast to friends, and also a ritual to drive evil spirits out of fruit trees and encourage them to bear well in the coming year. This event usually includes a Plough Blessing, a Mummers Play, and a Wassail of the apple trees. Children are invited to make and decorate rattles for making a great noise in the orchard.